Some of the most popular video games ever released are blank canvases, just waiting for your vision to be created. Rollercoaster Tycoon, Theme Hospital, Civilisation and many more have been the reason why countless players have spent hours upon hours locked away creating. One of the most popular games of this ‘build your own’ genre was the incredible Sim City. There really was no better feeling than getting the idea of your very own Metropolis out of your head and onto a screen. 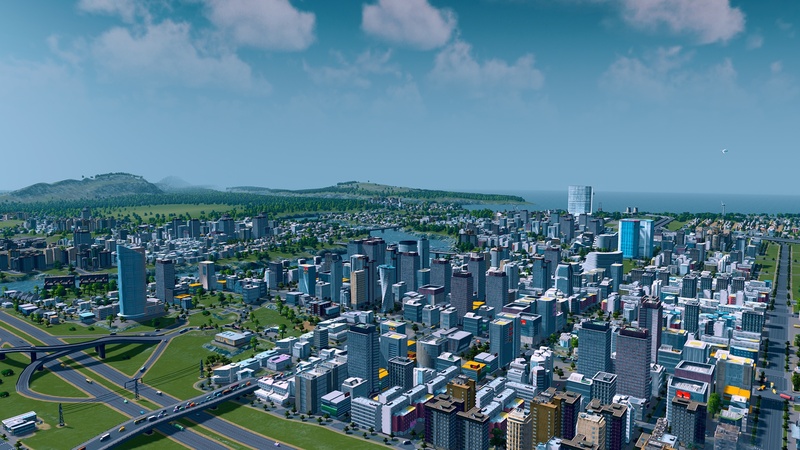 Over the years, the city-building genre has suffered a bit with no real decent releases for a long time; however, that all changed in the spring of 2015 when Paradox Interactive released Cities: Skylines. It was a major hit on the PC, and in 2017 it also made its console bow as it was released for the PlayStation 4 and Xbox One. 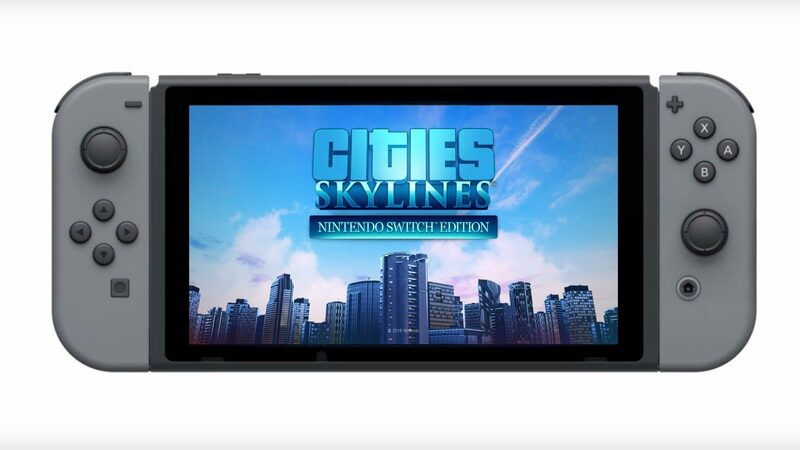 Due to just how big the game can be, a port to the Switch was spoken about on various forums (more hope than anything), but it didn’t look likely to happen, and then at the Nintendo Direct conference earlier this month, not only was it announced for the Switch, but Cities: Skylines for Nintendo Switch was released that very day. 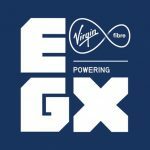 If you haven’t played or even heard of Cities: Skylines, and you have never really bothered with any city-building game before, here’s a quick catch up. When you start a game in Cities: Skylines, you are faced with nothing. You choose a plot of land from a dozen or so maps, you are given a sum of money to get you started, and you are then guided through an informative tutorial about how various aspects work while building a city, such as providing power and clean water, setting up public transports and various other infrastructures you can imagine being discussed in a city council meeting on a Monday morning. The tutorial, where informative at the time, does act a bit like a fed up substitute teacher, in that it will show you something once and once only. Much like Paradox’s other titles, such as Stellaris, noticeable pop-up will, well, pop up throughout the game, which can be helpful, especially if you’ve forgotten something you were shown ten minutes prior. You may be desperate to get in and start building, but you NEED to pay attention to the tutorial, especially if you are a newbie to the city-building world or, like me, you haven’t played one in over a decade. It may seem like it will take forever to get your modest plot of land into a buzzling, sprawling mastodon of a city, but you will get there; remember, Rome wasn’t built in a day! Watching your creation slowly come to life is one of the best aspects of Cities: Skylines as, when you have finished, there isn’t much else to do apart from obviously maintaining the city itself. Sim City had a bit of a different approach as you would have to deal with alien invasions and attacks from Godzilla every now and then, but when your city is created in Cities: Skylines, the most you have to deal with is an attack of the moaning inhabitants because you built a power station in their garden. This is where careful planning of your city becomes a necessity. Building power stations and other noisy, industrial-like buildings too near residential areas will result in complaints. Complaints will also come in thick and fast when deciding upon the numerous policies you set as mayor/lord/emperor of city-state. Policies can either be set to specific areas, or ‘districts’, or set for the whole city. Again, much like the real world of city managing politics, some citizens will love your policies, and others will rise up with flaming pitchforks in protest. You may choose to ignore such protests, but if more and more citizens detest your way of running ‘their’ city, then it can seriously damage the economy. Where most of the hard work, in terms of planning and management of your city will come from though, are the roads. It is easy enough to actually create the roads; Skylines’ slick menu allows you to easily place a road where you want, but again, it is all about the planning. Roads are the building blocks of all modern cities, and if you want your city to succeed, there are numerous aspects to take into account, such as ease of transport, rubbish collections, emergency service routes and the list goes on. 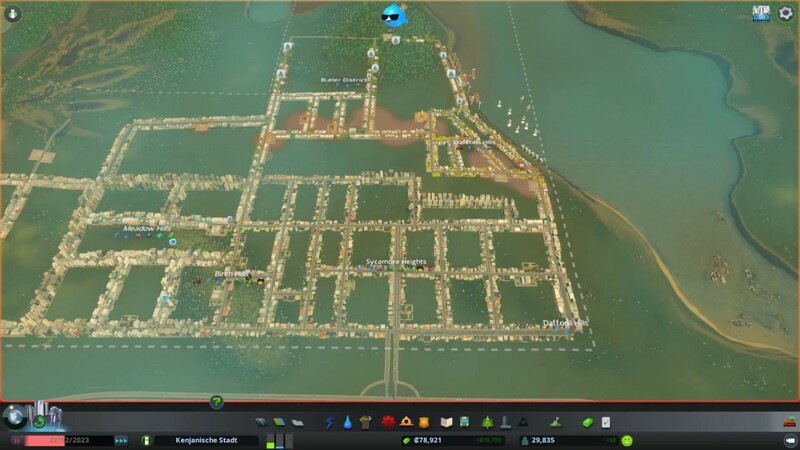 It can be a trial and error type of deal with the roads in Cities: Skylines, something in your head you may think will work could turn out to be a catastrophe when implanting said idea. 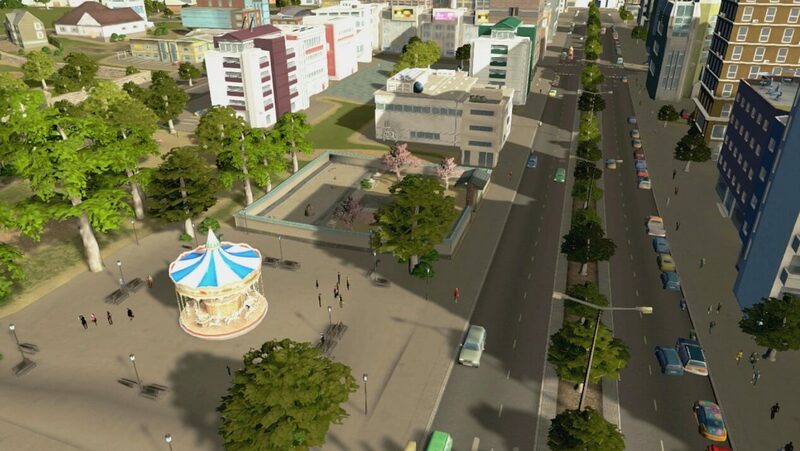 So how does Cities: Skylines fair on the Switch? Well, simply put, it does okay. Unfortunately, this is one of the least impressive ports to Nintendo’s hybrid console. For the most part, it holds up well, but when your city becomes bigger and bigger, the framerate can drop quite considerably. Also, zooming in on your city reveals just how scaled back the graphics had to be to make the port work. Would you zoom in enough to make this a big issue? Probably not, no, the majority of the time you will play with the camera zoomed out completely so you can keep an eye on your city as it progresses. As previously mentioned though, when your city gets bigger, the framerate can just drop. 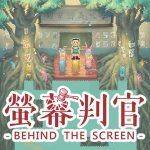 For players that enjoy the building rather than the management, this won’t be the end of the world as they can just start again or just build smaller towns; however, the majority of players will want to build a massive, sprawling city and then watch as life goes on by, and it is difficult to achieve that on the Switch. Of course, the advantage is that most PC and console gamers (unless they have a decent laptop or carry a TV around with them) cannot build and manage a city on the go. Cities: Skylines joins a long list of perfect commuter games as you can pick it up for an hour, build and manage for that time and put it back down and feel like you have actually used your commuting time productively rather than just scrolling through Facebook for an hour. There is also no performance difference between docked and portable modes, so playing on the go is an enjoyable experience, albeit with the issues that come with the Switch version. Another issue, and this isn’t just found on the Switch are, as you could have probably guessed, the controls. The menus themselves though are not an issue at all. Using the D-pad to move through the menus works perfectly, and it is easy to switch (pun sort of intended) between them. The issue comes with using a controller, instead of a mouse, to do some more intricate tasks, such as laying pipes and roads. You simply cannot get the level of control with a gamepad that you can with a mouse. It is an on-going criticism with games such as these where the lack of a mouse can hinder the gameplay and, therefore, your enjoyment. Cities: Skylines can obviously be enjoyed while using a controller, and if you have never played the PC version, then you won’t have as much of an issue. With the Switch version, you also get the first two DLCs included with the game, which are the After Dark and Snowfall expansions. After Dark, as you can imagine, gives you night time and some late night leisure buildings, like casinos. Snowfall gives you, that’s right, you’ve guessed it again, snow, and some other winter themed elements. Will the other six expansions be made available for download? Hopefully, as these expansions do add to the challenge of managing a city, especially the Natural Disasters expansion. Cities: Skylines for the Switch is a match made in heaven. A portable, detailed city building game that can be enjoyed in the comfort of your own home or on the go. Unfortunately, it isn’t quite the dream it should be due to the performance on Nintendo’s hybrid console. It can still be enjoyed, but players expecting the same level of performance they are used to on the PC or consoles will be left slightly disappointed, but even with the performance issues, Cities: Skylines is still an enjoyable title for the Switch. Controls can be frustrating while trying to lay pipes, etc.